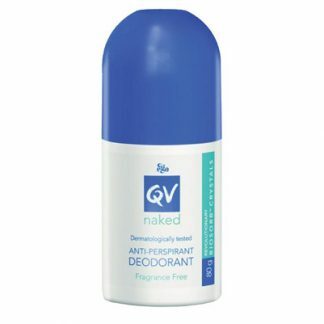 My Skin Pharmacy carries a select range of anti-sweating products including antiperspirant roll-on to facial gels. We also specially formulate products for specialist doctors which are not commercially available. We work alongside the Sweat Free specialist clinic to formulate quality medications to suit your needs. Patients must keep areas moisturised and hydrated when using topical medications. Sweating is a natural process for the body to regulate temperature and excrete any by products. 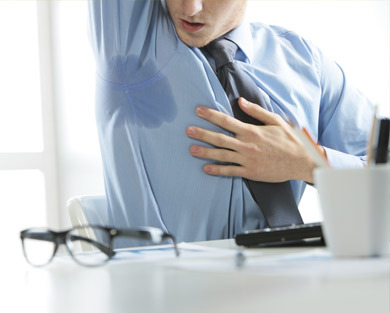 Anxiety, stress, physical activity, hormones and medical conditions may cause excessive sweating. It can be a very embarrassing condition for people and even affect their work and private life. WHAT IS THE BEST TREATMENT FOR MY EXCESSIVE SWEATING? The best treatment for anti-sweating will depend on the location of the sweating and involves multiple steps. Assessment from a specialist and getting the correct advice is very important. We will work closely with your health practitioner to ensure the best option for you. There are a variety of options including oral medications, topical creams, iontophoresis, botox and miradry. The best treatment will be dependent on your lifestyle and what is suitable for you. There are treatments that you can do daily, weekly and even monthly depending on your severity and response to treatment. Prescription medications are very effective however will require assessment from a practitioner. Propantheline tablets and glycopyrrolate lotions are the most commonly prescribed items for the effective treatment. One of the best treatments for hand and feet sweating is iontophoresis. This option is involves soaking the hands and or feet in a solution of glycopyrrolate whilst a mild electrical current is induced. The current encourages the penetration and uptake of the drug across the skin. Dryness can last for about 7 days. Products containing aluminium can help dry certain areas including the hands, feet, underarms, body and face. 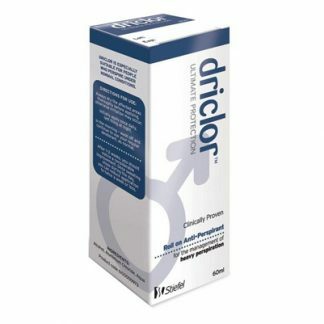 Products to initially try include Driclor, 3B face saver and no more sweat. These products need to be used daily. Commonly they will be applied to clean dry skin at night before bedtime. They working by preventing the sweat production. Anticholinergic medications such as Ditropan and Probanthine tablets are commonly prescribed for excessive sweating. They are easily taken orally up to 2-3 times daily. Anticholinergic medications have no specificity and will affect various parts of the body and not just sweaty areas. This in turn can lead to dry mucous membranes of the nostril, throat eyes and affect other areas of the body that are susceptible. The medication can effectively reduce sweating but are associated with some side effects. Side effects include: dry mouth, light headedness, blurred vision, and fatigue. Glycopyrrolate lotion is a very effective and easy form of application. This cream is only available on prescription and can be used for the underarms, hands, feet, head and neck. It is easy to apply and can be used once or twice daily. Some patients use the cream once daily whilst others only need to use it once weekly. Apply a small amount to the affected area and work it in thoroughly until absorbed. It is essential that the area be continually moisturised and hydrated to allow for effective re-application. If this is not done, then there will be a poor response on the next application. For the hands and feet, we recommend using an exfoliating pad or pumice stone twice weekly to exfoliate these areas and improve effectiveness. This form of treatment is effective for hands and feet for up to 2-3 weeks. Patients submerge their hands and feet in the solution and a small electrical current is induced. This aids in the penetration of the drug taking effect. We formulate and supply this solution for patients undergoing this form of therapy. Once stabilised on this therapy in clinic, patients can purchase the device and conduct therapy in the privacy of their own home. 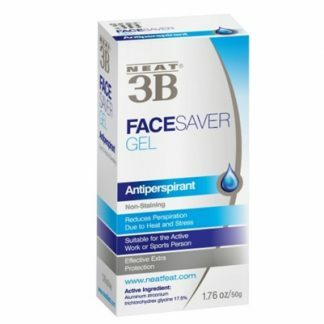 WHAT NON-PRESCRIPTION PRODUCTS ARE AVAILABLE FOR ANTI-SWEATING MANAGEMENT? No more sweat and Driclor are great products to start with. It contains a specially blended aluminium that constricts the sweat glands and prevents the sweat from exiting. Effects can last from 4-7 days. No more sweat is formulated for the hands, feet, body and face. They are suitable for sensitive areas. With most products, they need to be applied to clean dry skin at night only. Sweating occurs less at night and gives a chance for them medication to penetrate and take effect. It may be necessary to use a blow dryer to make the area as dry as possible. 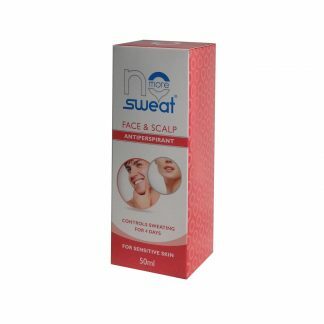 With most types of anti-sweat treatment, it is necessary to moisturise. This reduces sensitivity to the area and allows the skin to maintain the skin barrier integrity. Keeping the skin hydrated will also allow the next application of medication to penetrate more easily. This herbal extract can be effective in patients who have mild to moderate anxiety and stress that may be causing the excessive sweating. These assist in increasing the serotonin available in the nervous system to help with mood. The dosage is 900mg once or twice daily. Botox injection, miradry and surgery are other options available. Botox and miradry and great options for underarm sweating and a consulting practitioner can provide details to see if this option is suitable for you. Topical creams, tablets and iontophoresis are a little less invasive but generally do require ongoing treatment. Absorption pads can be an option in patients who sweat excessively under the arm pits. These can be quite impractical and uncomfortable for everyday use. WHAT CAN I DO TO PREVENT SWEATING?